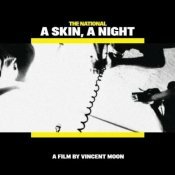 This is the context in which we are thrown into the world of The National in A Skin, A Night, as filmmaker Vincent Moon follows the band on tour and during the making of the wonderful, all-conquering Boxer. But as it turns out this is not your traditional "on the road/in the studio/talk about the band's history" documentary. Through the course of the hour long film Moon uses his own art form to deconstruct The National, their world and their art. From the very start, the dichotomy between the perceived glamour of being in a band and the reality of being on tour and in the studio is fully in evidence. The opening shots comprise violently flickering, stark black and white scenes of tortured on-stage performance and the slow motion baying of an enraptured crowd, incongruously backed by an almost white noise minimalist soundtrack. This portrayal of the blurred ecstasy of the stage cuts to a picture of the dishevelled band and crew packing up their white transit van, ready to hit the road once more. When the first dialogue of the film comes in the form of singer and lyricist Matt Berninger explaining how uncomfortable the band feels being filmed - "who wants to be caught on camera being just a person...full of anxiety and insecurity...nobody wants to be caught that way" and Padma Newsome (strings and keyboard) comparing the camera to a gun - it is clear that A Skin, A Night is not exactly going to be Summer Holiday. But then anyone who has ever listened to the The National would surely expect anything but light entertainment. Berninger's reaction to the camera makes a lot of sense as the film unfolds, both from the band's point of view - Moon spends long periods concentrating on lingering shots of the members of the band doing very little, sitting, standing, just hanging around - and his own, admitting that he has to drink lots of wine before a show and pretend he isn't on stage ("it's really scary"), though for once optimistically noting that there's "a lot of tension in the songs" so him being tense when he goes on stage actually works pretty well. To be honest, for much of A Skin, A Night it's easy to wonder why these people are even in a band and how they have lasted so long together. The early history of getting nowhere, a "horrible" tour to England and more is narrated in detail (Beiringer even breaks off in mid sentence to ask: "do you want me to carry on telling you the history?" as if it's that unbearable), while the frustrations of sound-checking, the torturous song-writing and repetitive recording processes, and strained inter-band (mainly sibling) relationships are all painfully obvious. Newsome even admits "I don't like travelling, I hate the music industry, but once I'm on stage...", but at the end of it all, that's what makes it all worthwhile: the music these people make together. And with the likes of 'Fake Empire', 'Slow Show' and 'Start A War' accompanying these, often moody, scenes, you're reminded just how great the band's soundtrack to their own lives is. In fact, any negativity construed from the above brings the quality of the music sharply into focus: the blood, sweat and tears that went into creating these songs are ingrained into the songs themselves. Unsurprisingly, The National's morose, meandering balladry works perfectly as a soundtrack to the pervading air of miserableness, something Moon only heightens with his frequently abstract film. Using grainy footage and unsteady camera work, alongside an array of colour techniques and interesting angles (filming the surreal recording studio scene of three men in headphones standing in a circle recording handclaps from below is a perfect way of highlighting the bizarre nature of such a process, while the continually panning circular panorama of an attic rehearsal space, revealing ever changing individuals sitting doing nothing or working on their own musical thing, is an inspired closing statement on the theme at the heart of the film) Moon floods the film with imagery. This ranges from the more obvious depiction of endless touring as illustrated by the repeated return to the view from plane, train or automobile window, scenery either flying past or in super slow-mo, to the more cerebral metaphor of kids flying paper aeroplanes on a housing estate accompanying the narration about the band's first glimmers of a breakthrough with Sad Songs for Dirty Lovers (2002). Much like Wilco's I Am Trying To Break Your Heart, A Skin, A Night illuminates the difficulties associated with being in a rock band striving to make a record they are happy with, and you get a glimpse of everything that goes in to the making of Boxer's quite brilliant songs - something that's either an entirely organic creative process or "a bunch of people trying different things" as described by Bryan Devendorf. Of course how much you enjoy this film will depend on whether you like the band's music, how much you want to know how it comes to be made, and how interested you are in the band as people. However, the filmmaking is such that a mere passing interest in music, or indeed film itself, will suffice: as far as music documentaries go it's one of the more absorbing. And anyone who's ever been on tour or in a recording studio will certainly identify with some of the more tiresome moments each can bring. Released alongside the DVD is The Virginia EP - a modestly titled 10 track album that provides a more than satisfactory companion piece to the film, with the odd new song presented alongside B-Sides, demo, session and live tracks. While fans are unlikely to be blown away by any of the versions of pre-released songs, it is a fine standalone collection. The demos sound like most other people's polished work and the live version of Springsteen's 'Mansion on the Hill' is a real treat. The opening trio of studio tracks (new one 'You've Done It Again Virginia' alongside B-Sides 'Santa Clara' and 'Blank Slate') are excellent additions to the band's canon and the closing 'Fake Empire'/'About Today' medley is really quite beautiful, with the audience handclaps on the former adding to the already spine-tingling atmosphere created by the song's performance. If you see beauty in the songs of The National, you will likely see beauty in this film (and undoubtedly in The Virginia EP). A Skin, A Night never stops moving, with either the rhythm of the music (be it soundtrack or incidental live snippets), the cadence of tired voices, or the world passing by a window to its own inescapable beat carrying it forward. Moon's film does cast a somewhat weary eye over the life of a modern musician and perhaps some time spent on the triumph of the album that resulted from all this stress would have made for a more balanced view, but it also provides a fascinating insight into the making of Boxer and the impressionist camerawork co-exists perfectly with the band's personalities and above all, music, to create something undeniably beautiful. It is, in the end, a fitting accompaniment to the understated majesty of The National's body of work.